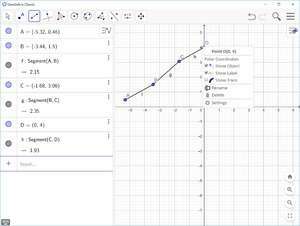 GeoGebra is a useful mathematics tool for education in secondary schools, which brings together geometry, algebra and calculus. GeoGebra is also a dynamic geometry system, meaning you can do constructions with points, segments, vectors, lines, conic sections as well as functions and change them dynamically afterwards. Version 6.0.533.0 is a freeware program which does not have restrictions and it's free so it doesn't cost anything. For security reasons, you should also check out the GeoGebra download at LO4D.com which includes virus and malware tests. Additional screenshots of this application download may be available, too. GeoGebra download been highly rated by our users.